What is Disposable Email Validation? Disposable email address allows a user to temporarily register and use an email address for receiving emails, which will expire after a certain time period. Hence, when a user is using this type of email address to sign up for a service, either free or paid, they are certainly do not want to reveal their true identity. Why are they doing so? Many reasons; perhaps they are fraudsters wanting to test their luck in your online store. Or, maybe they are your competitors trying to learn more about your services. For whatever reasons, this is a clear sign of a high risk transaction. In most cases, you may want to block all signups coming from the disposable email address. Now, the question is how can you find out if the email address is from a disposable service provider? To verify if an email address is a disposable email is not an easy task when performed manually. Perhaps, you may know a few of the famous disposable email providers, but there are thousands of such providers out there. We understand that you will need some help for this validation, and that’s the reason that we have introduced a new validation rule: Disposable Email Validation. 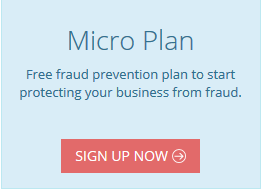 To date, FraudLabs Pro has thousands of disposable service providers in our records. And, the list is growing constantly. Our QA team will regularly research the web to make sure the list always contains the latest providers. 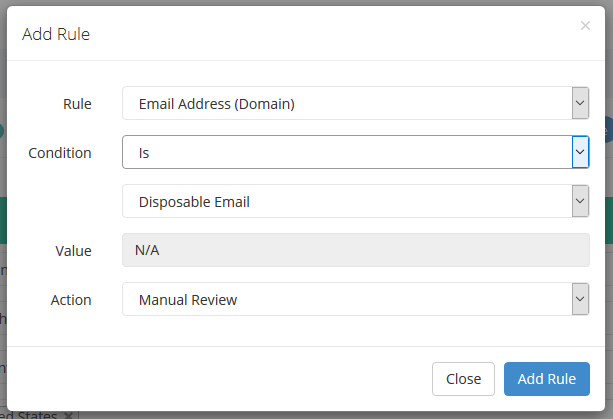 To enable the validation, you just need to create a new Disposable Email Validation rule and select an action, such as to manually review or reject the order. Once our system discovers the disposable email used in the order, it will notify you based on the selected action. As simple as this. The Disposable Email Validation is available for Small plan onwards. If you are interested to use this validation feature but are currently signed up with Micro or Mini plan, you may upgrade your plan in the account area at your convenience. Below are some screenshots of the result and rule validation. Disposable Email result shown in the details page. Create Disposable Email validation rule.